Join or renew your SEGD membership in August, and you could win a free year of membership or a free Firm Listing! Do you have a project you’d like to spotlight? A special skillset you’d like to share? An innovative product you think would benefit designers? Share your knowledge with the design community and potential clients and get visibility for yourself and your firm. The SEGD community has grown exponentially over the past 5 years with membership up almost 50% since 2012. Online through SEGD.org we now host over 370,000 visitors a year, many of which are potential clients. Promise, we can see from our analytics! SEGD members represent a diverse network of experts, innovators and practitioners. We are known as the most open friendly design association and our community is stronger because of the knowledge, skills and talents our members share. Member News: Do you have an innovative project or new cutting-edge product you’d like to highlight? Submit your announcement, story or press release to [email protected],and you could be featured on the SEGD website. 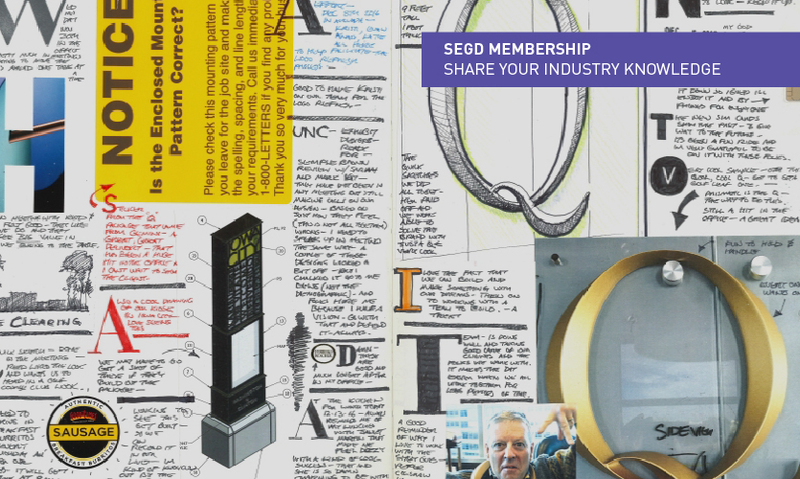 Only SEGD members can submit Member News for publication. Sketchbook: Join the Sketchbook galleryof illustrious designers by submitting your hand-drawn designs. Only SEGD members can submit their sketches for the Sketchbook gallery. Blog: Share your knowledge, observations, critical discourse and skills with the SEGD community by contributing a member blog.If accepted for publication, your blog will be featured on the SEGD.org home page, disseminated in the weekly newsletter and appear on your SEGD member bio. Only SEGD members can submit a blog for publication. Academic Summit and Journal: Every year, SEGD holds a call for papers to gather the new thinking about practice and education. Selected papers are presented at the Annual Academic Summit at the National Conference and published in the SEGD Academic Journal Communication + Place. Publication opportunities are available to SEGD members only. Webinars: Webinar topics come from the community. If you have skills in documentation, ADA and Codes, 3-D rendering, etc., and want to share them with the community, suggest a webinar for SEGD. Webinar opportunities are available to SEGD members only. SEGD Events: SEGD hosts six events a year on specific areas of practice such as wayfinding, placemaking and identity, exhibitions, urban and public spaces and experience design. Share your specialty as a presenter at one of these popular events. Speaker opportunities are available to SEGD members only. NEXPO: Showcase your products and services in front of the largest annual gathering of experiential graphic designers at the SEGD Conference. Exhibitor opportunities are available to SEGD members only. SEGDTalk Listserv: Nearly every day, designers use the SEGDTalk listserv to ask the community questions about their work. This is your chance to share your industry knowledge and get your name in front of other members. 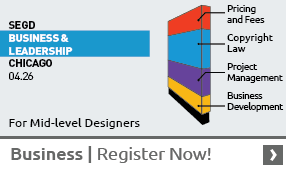 Access to the SEGDTalk listerv is available to SEGD members only. SEGD Global Design Awards: Submit your best, most-innovative projects for the SEGD Global Design Awards,and you could win a Merit or Honor Award, be recognized at the SEGD Global Design Awards presentation at the 2018 SEGD Conference Experience Minneapolis and have your project featured on the SEGD.org website. The lowest entry fees are available to SEGD members only. Are you ready to share your industry knowledge? Join or renewyour SEGD membership in August, and you could win a free year of membership or a free Firm Listing!